Study finds link between air pollution and increase in DNA damage ~ Health Matters Today! 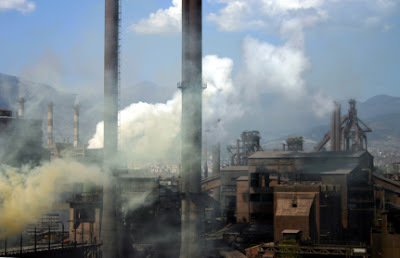 A study in the Czech Republic has found a link between exposure to certain air pollutants and an increase in DNA damage for people exposed to high levels of the pollution. They found that breathing small quantities of a polycyclic aromatic hydrocarbon (PAH), called benzo[a]pyrene (B[a]P), caused an increase in the number of certain 'biomarkers' in DNA associated with a higher risk of diseases, including cancer. Air pollution is a major problem around the world, particularly in urban areas. In attempt to control regional air pollution levels, the EU has introduced legal limits for exposure to a variety of different airborne pollutants. For B[a]P , the EU air quality standard is 1 nanogram per metre3 (ng/m3) as an annual average that has to be attained where possible throughout the EU. To measure the risk of DNA damage and risk to health caused by exposure to chemicals, such as PAHs, researchers sometimes use 'biomarkers' – these are biological features that can provide an indicative picture of risk and disease. Previous studies have suggested that 'DNA adducts' can be used as biomarkers to measure exposure to PAHs. These are, in effect, small molecules, such as PAHs, bound to the DNA. Similarly, 'chromosomal aberrations' - structural changes to a stretch of DNA - can be used as biomarkers to demonstrate the effect of some pollutants on DNA. To test whether there was a possible link between exposure to PAHs and the frequency of DNA adducts and chromosomal aberrations, the researchers, supported by the EU EnviRisk and INTARESE projects, examined DNA from 950 police officers and bus drivers in Prague. The participants, drawn from three separate studies conducted over a five-year period, all worked outdoors for more than eight hours a day. Each carried a device to measure their personal exposure to PAHs and DNA was extracted from the participants' white blood cells. The researchers also tested a new technique for identifying chromosomal aberrations called 'fluorescence in-situ hybridisation', or FISH, which is much more sensitive than previous techniques. The results revealed, for the first time, a significant relationship between exposure to PAHs, the number of DNA adducts and the number of chromosomal aberrations detected using FISH. In particular, PAH levels and the occurrence of the two biomarkers were higher in winter than in summer. In one of the studies, average personal exposure to B[a]P and PAHs in January was measured as 1.58 ng/m3 and 9.07 ng/m3, respectively. In June, this dropped to 0.18 ng/m3 and 1.92 ng/m3. The number of B[a]P-like DNA adducts and chromosomal aberrations were correspondingly much higher in January than in June. In fact, the number of DNA adducts strongly mirrored exposure to PAHs in the past 30 days. These findings are of concern because exposure to more than 1 ng/m3 of B[a]P has been found to put people at higher risk of developing cancer later in life. Previous studies have shown that DNA adducts can be an indicator for cancer several years after exposure and the findings of this study indicate that DNA adduct biomarkers and chromosomal aberrations measured using FISH could help health authorities identify individuals at higher risk of disease.